for Campus Compact member campuses. This book is a companion guide to Campus Compact’s successful publication The Community Engagement Professional in Higher Education. In the first text, Campus Compact Research Fellows - led by award-winning scholar-practitioner Lina D. Dostilio - identified a core of set of competencies needed by professionals charged with leading community engaged work on college campuses. 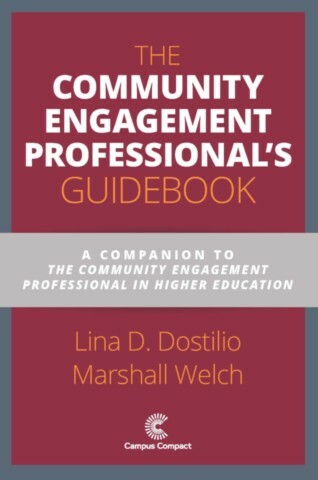 In this companion guide, Dostilio teams up with Marshall Welch to build on the initial framework by offering guidance for how a community engagement professional (CEP) should conceptualize, understand, and develop their practice in each of the original competency areas. The Guidebook offers a rich and deep dive, breaking down the essential components of a professional’s work. From mentoring faculty research, leading campaigns to build civic engagement curriculum on campus, to managing the staff who support community engagement units, Dostilio and Welch tackle the breadth of the CEP’s work by drawing on key resources and their own decades of experience in the field. Throughout the book, readers will encounter “Compass Points” that call for personal reflection and engagement with the text. These interactive moments combine with end-of-chapter questions to prompt thinking about a CEP’s critical commitments, to create a powerful and engaging toolkit that will be essential for any person doing community and civic engagement work on campus. 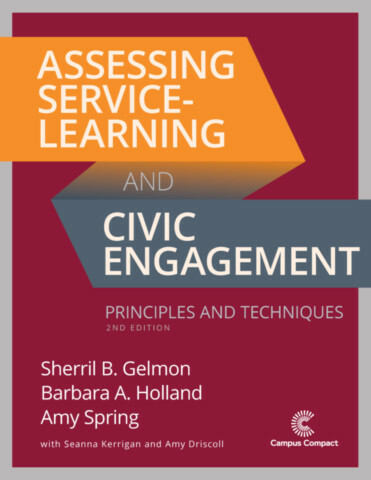 This book offers a broad overview of many issues related to assessment in higher education, with specific application for understanding the impact of service-learning and civic engagement initiatives. This revised edition includes an additional chapter that explores recent changes in the assessment landscape and offers examples and resources for designing assessment strategies for community engagement in higher education. The original text includes narrative addressing assessment issues and strategies; a detailed discussion of learning from multiple research projects performed over the past two decades about impact on multiple constituencies –students, faculty, communities, and institutions; and a discussion of strategies for data collection, analysis, synthesis, and reporting. Specific assessment instruments for use with each constituency are provided, including suggestions for administration, preparation, and data analysis. This volume will be helpful for individuals seeking a comprehensive resource on assessment issues in higher education. The Carnegie Engagement Classification is designed to be a form of evidence-based documentation that a campus meets the criteria to be recognized as a community engaged institution. 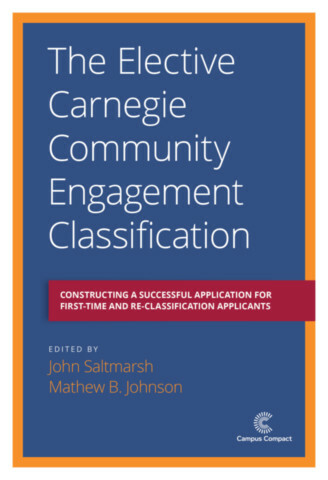 Editors John Saltmarsh and Mathew B. Johnson use their extensive experience working with the Carnegie Engagement Classification to offer a collection of resources for institutions that are interested in making a first-time or reclassification application for this recognition. Contributors offer insight on approaches to collecting the materials needed for an application and strategies for creating a complete and successful application. Chapters include detailed descriptions of what happened on campuses that succeeded in their application attempts and even reflection from a campus that failed on their first application. Readers can make use of worksheets at the end of each chapter to organize their own classification efforts. This book, offered by “practitioner-scholars,” is an exploration and identification of the knowledge, skills, and dispositions that are central to supporting effective community engagement practices between higher education and communities. The discussion and review of these core competencies are framed within a broader context of the changing landscape of institutional community engagement and the emergence of the Community Engagement Professional as a facilitator of engaged teaching, research, and institutional partnerships distinct from other academic professionals. Central to the work is a presentation of the core competency findings, along with suggestions for continued exploration. 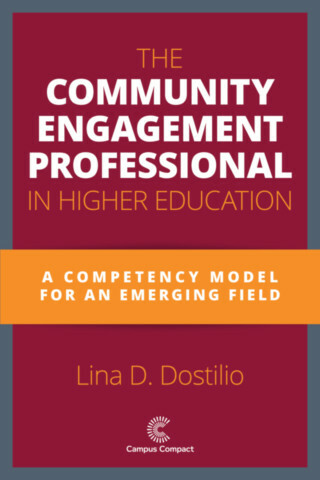 Dostilio and her colleagues argue that Community Engagement Professionals should claim a professional identity grounded in a set of core competencies, values, and knowledge, and through association with a community of scholar practitioners similarly dedicated. Additional work to understand and empower Community Engagement Professionals in their role as distinct from other higher education professional types will enable both broader impact for institutions and communities now with a view to prepare those coming to the role for a dynamic and demanding environment without distinct boundaries. 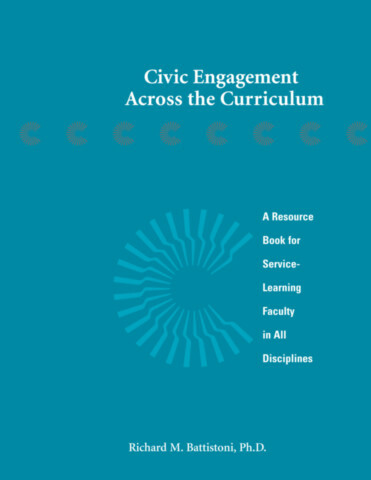 Civic Education Across the Curriculum offers faculty in all disciplines rationales and resources for connecting their service-learning efforts to the broader goals of civic engagement. Campuses promoting engagement are beginning to tie service-learning practices to their civic mission of preparing students for participation in a diverse, democratic society. There are, however, few resources for faculty—especially those in fields not traditionally linked with civic education—to think about how civic engagement might be incorporated into their own disciplinary perspectives and course goals. This volume distills a wide range of disciplinary perspectives on citizenship into usable conceptual frameworks. It provides concrete examples of course materials, exercises, and assignments that can be used in service-learning courses to develop students’ civic capacities, regardless of disciplinary area. This volume will assist faculty in their own curricular work as well as enable them to combine their individual initiatives with others across their campus. For directors of campus centers that have received the Carnegie Classification for Community Engagement, this book offers research and models to further advance their work. For directors starting out, or preparing for application for the Carnegie Classification, it provides guidance on setting up and structuring centers as well as practical insights into the process of application and the criteria they will need to meet. Building on the findings of the research undertaken by the author and John Saltmarsh on the infrastructure of campus centers for engagement that have received the Carnegie Classification for Community, this book responds to the expressed needs of the participating center directors for models and practices they could share and use with faculty, and mid-level and upper-level administrators to more fully embed engagement into institutional culture and practice. 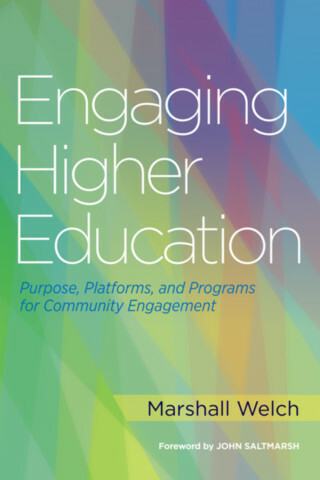 This book is organized around the purpose (the “why”), platforms (the “how”), and programs (the “what”) that drive and frame community engagement in higher education, offering practitioners valuable information on trends of current practice based on Carnegie Classification criteria. It will also serve the needs of graduate students aspiring to become the future professoriate as engaged scholars, or considering preparation for new administrative positions being created at centers. 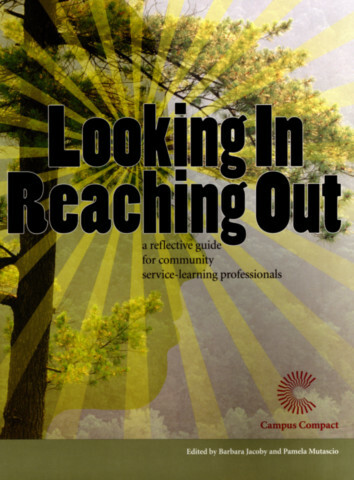 Looking In, Reaching Out is an essential hands-on guide for community service-learning professionals. It's packed with tools, worksheets, and insights designed to provide you with the skills, confidence, support, and balance you need to be successful in your professional and personal lives. The guide is self-paced; each chapter can be read on its own, or you can read the entire book from start to finish. Thoughtful worksheets allow you to take the concepts that are written and apply them to your personal situation, giving you a tailor-made experience.